A tapered straight cementless stem was used for revision in a group of old and very old patients. We wanted to know whether the use of this implant could achieve satisfactory results despite age and osteoporosis. 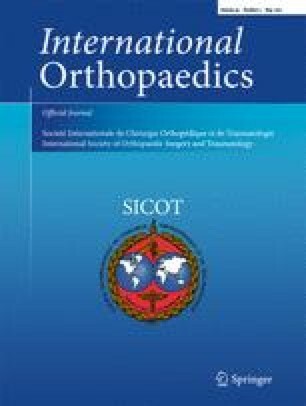 We retrospectively analysed data of 77 elderly patients (77 hips) who underwent revision in cemented and uncemented primary total hip arthroplasties (THA). The patients had a mean age of 82.2 years (range, 75–92 years) at revision surgery. They were monitored for a mean follow up of 7.1 years (range, 5.0–10.2 years). During the minimum follow-up period 11 patients died of unrelated causes, leaving 66 patients (66 hips) for evaluation. During the period of study three stems failed due to aseptic loosening, three hips dislocated and were successfully treated by closed reduction and bracing. No infection, osteolysis or significant stress shielding around the stems was observed. The survivorship at an average of 7.1-year follow-up was 95.5%. These results indicate that this stem is an excellent alternative in revision THA in patients of 75 years or older.